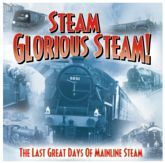 The sound of Britain's great steam locomotives! Thrilling stereo recordings famously captured by Peter Handford on location during the late 1950s and early 1960s: a time when stereo discs were the latest thing. Over an hour of audio, with all tracks digitally re-mastered.